In J. 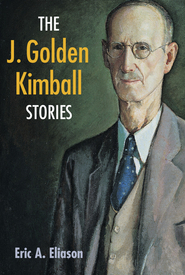 Golden Kimball: The Remarkable Man Behind the Colorful Stories, readers are invited to come to better know this legendary man made famous by his unique humor and powerful testimony. From a chronicle of Kimball’s youthful adventures to the legacy he forged in his more than forty years as a General Authority, gear up for a rollicking ride through the life of one of the liveliest servants of the Lord. Kathryn Jenkins Gordon is the managing editor at Covenant Communications. She is a writer and editor who has worked for forty-three years in corporate and internal communications. The author did a good job bringing the reader into J. 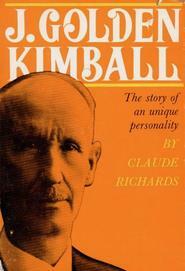 Golden Kimball's life, helping us get to know him better. Before reading this book, the only thing I really knew about him was that he had a bit of a foul mouth. And that point is brought home time and again in this book. But we also get to learn about how strong his faith and devotion to the gospel were, something I think is much more important to focus on. I love the quote from Elder Hugh B. Brown near the end of the book where he says "He has kept a sense of humor in the Church, and believes the "trip to Heaven" should be a joyous one. Every group is made happier by his presence, and when he leaves us the angels will greet him with a smile." I'm glad I had the opportunity to read this book so that I could better come to know this remarkable man. Even though I was raised in the Mormon church, I hadn't heard about J. Golden Kimball before. This book gave inspiring and fascinating insight into his early life, his missionary work in the volatile and violent post-Civil War Southern states, his struggles with his marriage, family and finances, and most importantly, his stalwart testimony of the gospel. Several of the anecdotes made me chuckle or laugh out loud, and I found that I didn't want to put the book down- which never happens with nonfiction for me! This is by far the most enjoyable biography I've read. Even though Kimball is perceived as an optimistic, humorous, and irreverent character, there was a respectful tone as the difficult and sad parts of his private life were explored. I was able to feel the Spirit as I read about the second generation of Latter-day Saints that Kimball served and served with. I loved learning more about this man of God who wasn't perfect and was beloved for it.